Muscle wasting with chronic diseases: Can Sirtuins fix the problem? Prognosis of a chronic disease worsens when associated with uncontrolled muscle loss. Muscle wasting can become the last nail in the coffin when accompanied with chronic diseases like cancer, heart failure, chronic obstructive pulmonary disease and infective diseases like AIDS etc. This multifactorial syndrome not only results to loss of body weight, but also triggers metabolic abnormalities and systemic inflammation, leading to impaired survival. Though Hippocrates first described muscle wasting, also known as cachexia, we are still struggling to find an effective treatment to conquer it. For one, cachexia is an under-estimated metabolic syndrome because treating the underlying disease is always the priority. Another reason for partial success of the clinical trials undertaken so far is the mono-therapeutic approach such as use of anti-inflammatory or anti-anorectic drug treatments, though cachectic pathophysiology appears to originate from multiple local and systemic causative factors. In a healthy individual, both the anabolic process of protein synthesis and the catabolic pathway of protein degradation are well orchestrated. However, this perfect balance goes haywire in cachectic syndrome, where protein degradation out-paces slow rate of protein synthesis. Mortality rates of patients significantly increase when the disease is associated with cachexia, compared to one where muscle mass is maintained. To overcome cachexia, it is necessary to identify as many affected molecular targets to curb the over-zealous muscle catabolism and thereby improve the quality of life. In order to identify causative factors for cachexia we stumbled upon sirtuins, a group of protein modifier enzymes implied in regulation of cellular metabolism, aging and in extension of organism’s life span. These enzymes, also known as histone or lysine deacetylases, can sense energy crisis at the cellular level. Sirtuin 6 (SIRT6) is a member of this family and is a key regulator of multiple cellular pathways to maintain overall health of the organism. Loss of SIRT6 led to modulation of genes known to be active in cachexia, reduction in muscle proteins and thereby muscle degeneration in mouse models (Fig. 1). 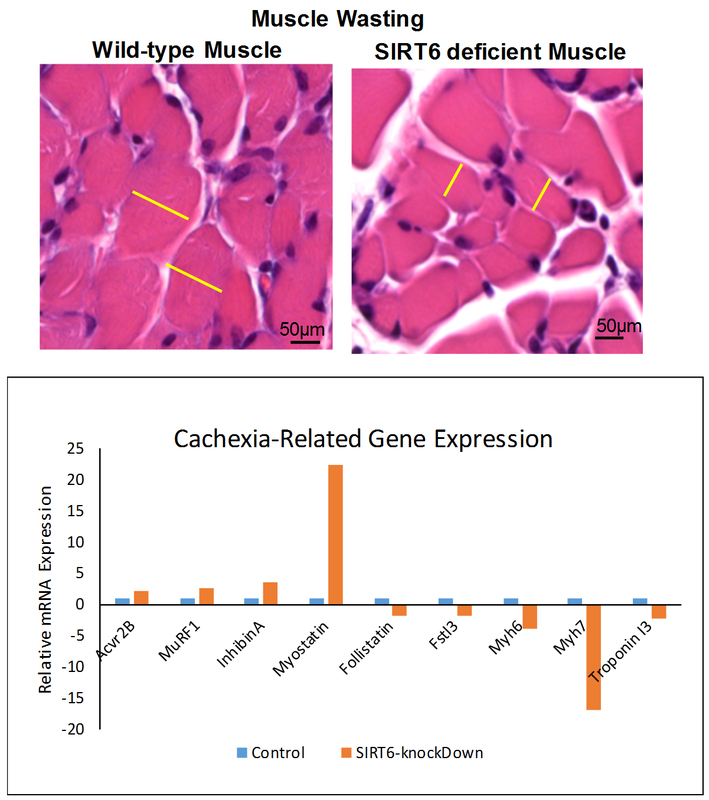 Restoring expression of SIRT6 reinstated muscle protein expression. Previously, SIRT6 was shown to curb inflammatory pathways and is reported to be a suppressor of certain tumors. Since SIRT6 is a molecule that can regulate multiple aspects of muscle wasting, it will be certainly advantageous to develop novel therapeutic approaches to maintain SIRT6 levels, which has potential to block the debilitating and life-threatening muscle-wasting syndrome. The histone deacetylase SIRT6 blocks myostatin expression and development of muscle atrophy.